There isn’t much Joe Caprio has done in his career he hasn’t learned something from. Instead, he learned the ropes of sales at his first job selling insurance and financial planning services at John Hancock, which provided a valuable launch pad for his future. Joe is now the Vice President of Inside Sales at Insight Squared, a sales intelligent platform that turns your CRM data into decision-oriented and actionable reports. 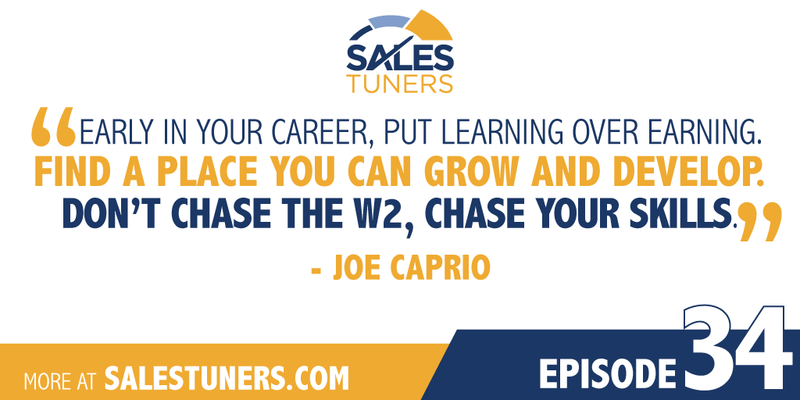 When he’s not perfecting his famous meatball recipe or showing off his sleeve tattoo while riding his yellow Harley-Davidson sportster, Joe is helping his team become subject matter experts. He’s essentially putting research and what he’s learned to practice. Why? Because his passion for learning from life experiences is the thread that ties everything together for him. His desire to constantly learn and improve has helped drive his success to the point he said his one piece of advice for his 22-year-old self would be to learn faster. He’s driven, he’s competitive and he knows a thing or two about how to lead a team. Play By The Numbers: Ask not what the numbers can do for you but what you can do with your numbers. If you have tools available for tracking, do more than use them. Make them work for you by analyzing what they mean for your business. You know what you do every day so don’t just accept it and move on. Keep track of it and use the data to improve your process. Work Harder AND Smarter: Instead of debating whether to work harder or smarter, do both. There are those who will say there is no substitute for hard work, efficiency and high conversion rates. But why not work smarter as well? Once you’ve learned how to be efficient, don’t stop there. Instead, be smart. Put your knowledge and experience to work for you by doing more of what works and less of what doesn’t work. Stay on your toes by mixing it up regularly, and whatever you do don’t stop growing. Treat Prospects Like Your Aunt or Uncle: Doing so creates a built in level of respect. You’re not going to upset them or step on their toes. That said, you’re allowed to disagree with your family, right? So, if you create the same dynamic with your prospects, you can respectfully tell them they’re wrong and educate them based on the perspective you have.